As reported earlier this year, the United Nations Human Rights Committee has been attempting to redefine an important international human rights treaty by claiming that the “right to life” means that states should legalize abortion under expansive terms. This past July, the committee released a document called General Comment No. 36 which seeks to reinterpret the International Covenant on Civil and Political Rights (ICCPR) to say that states “must” provide access to abortion, and permit states to legalize assisted suicide and euthanasia. In response, the Population Research Institute (PRI), in concert with other pro-life organizations and academics around the world, has called upon the Human Rights Committee to protect the right to life at all stages of development. We made clear to the committee that neither the ICCPR nor the customary norms of international law obligate any state to legalize abortion. We further endeavoured to debunk some widely held myths pro-abortion advocates commonly use in justifying an invention of a “right” to abortion. My full written comment on behalf of PRI to the Human Rights Committee can be viewed here. Several countries have also responded to General Comment No. 36, condemning the committee’s pro-abortion activism. While the Human Rights Committee has gained a reputation for routinely subjecting countries to rebuke for their pro-life laws, General Comment No. 36 would permit the committee to place considerably more pressure on states to legalize abortion. There would be much at stake if the comment is adopted. The ICCPR is one of the oldest, most revered and widely adopted United Nations human rights treaties. States that have adopted the ICCPR (i.e. “state parties”) are bound by international law to faithfully observe the treaty’s terms. The United States, as a state party to the ICCPR, is bound by the U.S. Constitution to abide by the treaty. General comments are essentially official statements by the committee on how they interpret the treaty. While states are free to ignore the parts of general comments that do not accord with their obligations under the ICCPR, they are widely recognized as authoritative and can place increased pressure on state parties to comply. 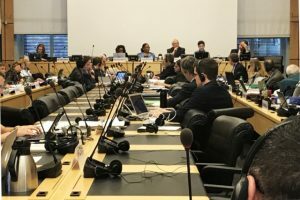 The Human Right Committee is tasked with monitoring the implementation of the ICCPR, with writing general comments, and with offering non-binding recommendations to state parties on fulfilling their obligations under the treaty. But, as we were keen to point out, the committee has no authority to create new obligations or to reinterpret the treaty in manner contrary to the text of the ICCPR. As mentioned already, article 6(1) of the ICCPR explicitly recognizes the right to life of “every human being” and that this right should be “protected by law.” Article 2 of the covenant declares that this right should respected “without distinction of any kind” including by “birth or other status.” Article 7 further prohibits anyone to be subjected to “torture or to cruel, inhuman or degrading treatment or punishment.” Abortion procedures crush, poison, or dismember the unborn child, many of whom are able to feel pain, and clearly constitute the most cruel, inhumane, and degrading treatment imaginable. The Japanese delegation echoed this sentiment at the following meeting, saying to the effect, “the main reason for inserting the provision concerning pregnant women was to avoid involving in the death penalty a person who was not connected with the crime.” It is thus impossible to read any “right” to abortion into the ICCPR. It is impossible for the Human Rights Committee to claim that states are obligated to legalize abortion under customary international law. A significant number of countries protect the right to life for the unborn child by law, several of them from the moment of conception. In fact, a majority of U.N.-recognized states (56%) have not legalized abortion under even the minimum cases the committee is now demanding that they be provided. It is clear that no so-called “right” to abortion exists in either the ICCPR or in states’ obligations under international law. On the contrary, the ICCPR recognizes the right to life for “every human being,” including the unborn child, the sick, the elderly, and the disabled. The Human Rights Committee must abide by its mandate and must cease its attempts to reinterpret the covenant in a manner never intended by state parties. Jonathan Abbamonte is a research analyst at the Population Research Institute. This entry was posted on Friday, November 3rd, 2017 at 6:29 pm	and is filed under News & Commentary, Uncategorized. You can follow any responses to this entry through the RSS 2.0 feed. You can skip to the end and leave a response. Pinging is currently not allowed.